Following my post Celebrating Mother's Day? a few days ago, I have a after thought and it gets stronger after seeing many of my friends posted in social media about Mum's wish list, gift ideas for the husbands, perfect gifts for Mothers. Seriously, what is the PERFECT gift for Mothers or is there even something called the PERFECT gift? What does a Mother want? Ok let me rephrase, what are the gifts that a Mother deserves or desire? * a romantic candle light dinner in a posh restaurant? * a very expensive branded bag/wallet? * a high end kitchen gadget? * a 2 hours spa treat? * a dinner prepared by the husband? * a super expensive bouquet of your favourite flower? How about happiness? Or to be exact Time Off Happiness? Let's face it, even though we proclaimed equality in parenting, dads getting more involved in the kids and all the whole nine yards, the truth is we know our kids will always look for us; the Mother, the Mum, for anything and every thing. Have you seen the quote below floating around in the web? Mothers handle different level of work stress and pressure depending on their job requirements and company environment. Add that to the the above demands from one kid, double that if you have two so on and so forth. What to do think is the state of mind of the Mother now? Get the idea already? Good! "Happiness?" you asked. Of course Mothers naturally feels happy when work runs smoothly, when their loved ones are healthy and happy, when their kids excel in some achievements etc, but what about deep down inside them? Do they feel happy FOR themselves? Do they have a sense of fulfillment? Are their emotions and love tanks filled to the brim daily? With all the responsibilities weighing on their shoulders making them feel like a stretched rubber band, most of the time Mothers are burnt out or too tired to do anything for themselves. Some of us, the lucky ones, gets to go for facial, spa, manicure and pedicure, girls night out frequently. Even so, we always feel a sense of guilt creepy behind us when we are away from our family, having fun without them. My point is a Mother deserves to get away from the family demands after work for a couple of hours a week to recharge, doing something that will relax them both mentally and physically, of course doing it without a sense of guilt will be a bonus. A Mother who is truly happy have a well balanced state of mind which in turns benefits the whole family. For a start, they are able to meet the never ending demands from their kids and deals with them with a clear and positive mind. No more yelling or brushing the kid off, YEAH! 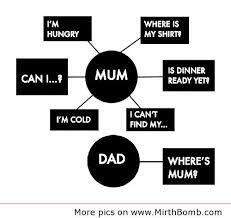 So to all husbands, if you have not done so, why not start by doing it today, on Mother's Day? Give your wife guilt free Time-Off Happiness. Emotional & love tanks are the basis of every thing. Once it is filled up you will not feel frustrated or think that you are being treated unfairly or not even feel appreciated on the things you do for others. When you are well balanced you will not have negative thoughts that leads to negative behaviour. Going to ask to bring kids for lunch. I want me time! Pc, u need it, especially away from #2 who is so clingy and close to you =) Me time so that you can refresh yourself and be there for her in a better state of mind and body.